While I was home recently, my family threw a party for our good friend Jerry McConnell. It was his 85 th birthday and we had a great time. There was an insane spread of food prepared, and I was in charge of the cake. 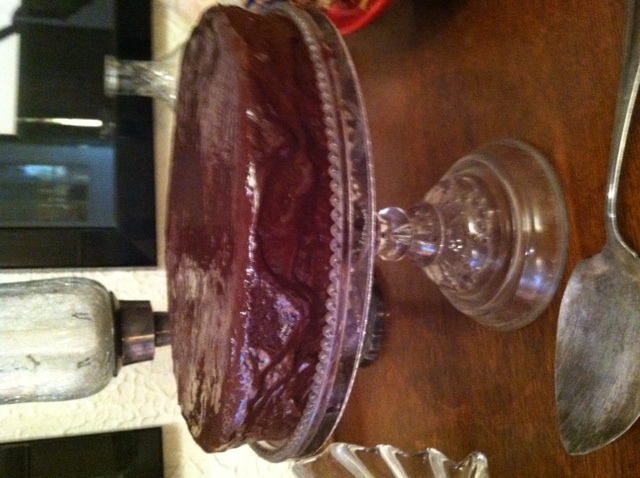 I made the chocolate ganache cake from the Barefoot Contessa. This has to be the easiest cake recipe ever and it is delicious. It takes no time to whip up and creates this incredibly thick, fudge like single layer cake with a decadent ganache frosting. 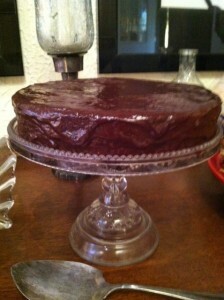 My mother and I have made it for a number of occasions due to it’s ease and deliciousness. The recipe calls for a double boiler to make the frosting. If you don’t have a real one, don’t worry. All you need is a pot of boiling water and either a glass or metal mixing bowl. Set the pot to simmer and set the bowl on top of the pot, not touching the water. Hold it with a pot holder and slowly melt the chocolate. This prevents it from burning the chocolate and helps it melt evenly. Also, here is my tip for frosting the cake. When you put the cake on the wire rack for frosting, set the rack on top of a foil lined cookie sheet. This will make your cleanup fast and easy. If you don’t, you will have chocolate sauce all over your countertop. This was a brilliant tip from my mother. I recommend it. 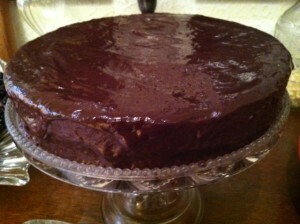 And I recommend you make this cake. It is a wonderful special occasion treat and a real crowd pleaser. 1 Preheat the oven to 325 degrees. 2 Butter and flour an 8 inch round cake pan, then cover the bottom with parchment paper. 3 Cream the butter and sugar in the bowl of an electric mixer fitted with the paddle attachment until light and fluffy. 4 Add the eggs one at a time. 5 Mix in the syrup and vanilla. 6 Add the flour and mix until JUST combined (overbeating with make the cake too tough). 7 Pour the batter into the pan and bake for 40-45 minutes, or until just set in the middle. 8 Let cool thoroughly in the pan. 9 For the ganache, cook the heavy cream, chocolate chips, and coffee in the top of a double boiler over simmering water until smooth and warm, stirring occasionally. 10 Place the cake upside down on a wire rack and pour the glaze evenly over the top, making sure to cover the entire cake and sides. 11 You can tilt the rack to smooth the glaze. A rubber spatula is also handy. Hiya, I am really glad I have found this information. Today bloggers publish just about gossips and net and this is really irritating. A good web site with exciting content, that is what I need. Thanks for keeping this web site, I will be visiting it. Do you do newsletters? Cant find it. great put up, very informative. I ponder why the other specialists of this sector don’t notice this. You should continue your writing. I am sure, you’ve a huge readers’ base already! Hi my family member! I want to say that this post is amazing, nice written and include almost all significant infos. I¡¦d like to look more posts like this . It¡¦s really a nice and useful piece of information. I am satisfied that you just shared this helpful info with us. Please stay us up to date like this. Thanks for sharing. I’ll right away take hold of your rss feed as I can’t to find your e-mail subscription hyperlink or newsletter service. Do you’ve any? Kindly permit me realize in order that I may subscribe. Thanks. Throughout this grand pattern of things you actually get an A+ with regard to effort and hard work. Where exactly you actually lost me ended up being in the details. As people say, the devil is in the details… And that could not be more true here. Having said that, permit me inform you what exactly did do the job. Your writing is extremely persuasive and that is most likely the reason why I am taking an effort in order to comment. I do not really make it a regular habit of doing that. 2nd, although I can certainly notice the leaps in reason you come up with, I am definitely not certain of how you seem to connect the details which produce your final result. For right now I shall subscribe to your issue however wish in the near future you actually connect the dots better.